Concert and Tenor Ukulele – some larger Ukuleles. In this post we will say some more about the Concert and Tenor Ukulele. This Ukuleles is larger than the normal Soprano Ukulele, have more frets that gives you some more possibility regarding the sound range, and have a slightly different sound. Our post Ukulele types, decribes all the different types of Ukuleles, with measurements and tuning. The Baritone Ukulele is even bigger and has its own post Baritone Ukulele. We are not quite sure when the Concert Ukulele was «invented», but we know that it was on the marked from 1925, produced by Martin & Co. Some also call this Ukulele for Alto or Super Soprano. The Concert Ukelele is a little bit larger than the Standard (Soprano) Ukulele. The sound is also a bit different, or more heavy, than the Soprano. Here you have some prices from AliExpress. The first Concert Ukuleles came with 12 frets. Today the Concert Ukuleles have from 14 frets to 20. Normally 14 or 15, and tuned to GCEA, as a Soprano Ukulele. It is easier for people with large fingers to play this Ukulele that has larger body and neck, compared to the Soprano. The size makes therefore the frets more spaced. The Tenor Ukulele was invented right after the Concert Ukulele. We know that it was on the marked in 1928, but it my also be a year or two before. The first we have found came with 12 frets, and later changed to 14. Today it is normal with 16 frets or 15+, as it is described. This Ukulele has a wider sound range than the Soprano and the Concert Ukulele. Here are some prices from AliExpress. The Tenor Ukulele is great for performers because of its full sound, and the payer can reach higher notes because it have more frets than the smaller Ukuleles. The Tenor Ukulele is also larger than the Concert Ukulele (but smaller than the Baritone). For this reason many players prefer this size because it is easier to hold. It fits probably the body of an adult better. This instrument is also produced with 6 and 8 strings, but the normal is 4 as Ukulele. Normal tuning is GCEA re-entrant or GCEA linear. Se post about How to tune a Ukulele. 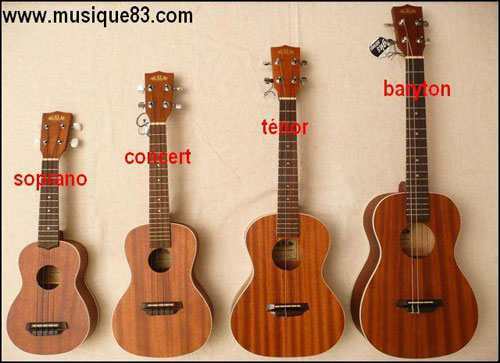 We have here a clip that shows the difference between the Soprano, Concert and Tenor Ukulele. This picture from musique83 shows the difference in sizes.